When we were looking for a place to have lunch on Good Friday, Jo told me to find a place that I was interested in trying. Varasano’s Pizzeria has been on my list since April of 2010, when they were listed in the pizza section of the Cheap Eats issue of Atlanta Magazine, but we had never been. 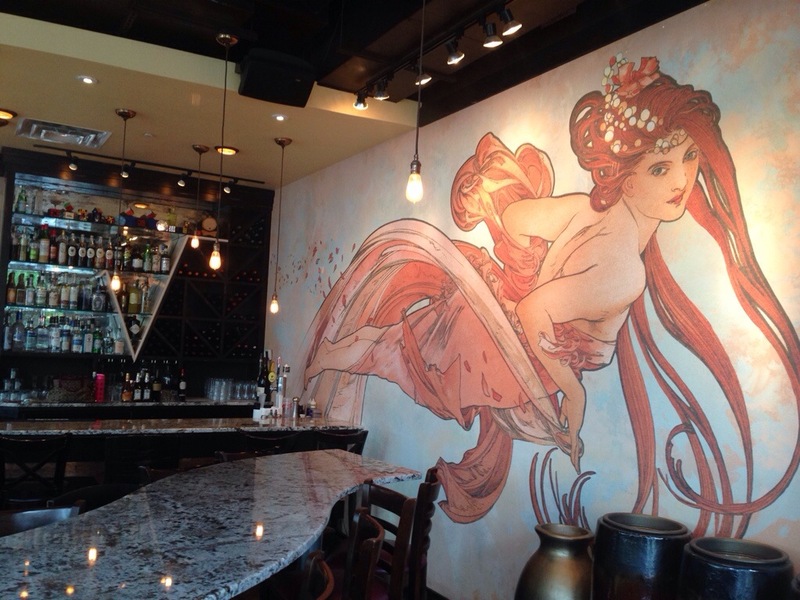 Last year, they were voted the best pizza in Atlanta by the AJC and Jezebel Magazine. They are only open for lunch Friday – Sunday, dinner every day. Parking is a premium – pay attention to the signs. 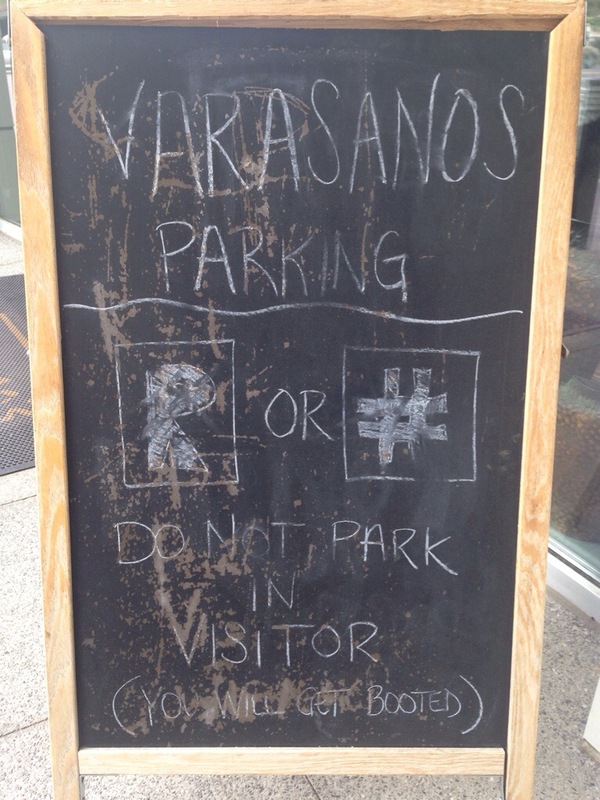 They even warn you again with a chalkboard sign before you walk in the front door. and took a seat on the same side of a four-top by the windows, looking into the open kitchen. 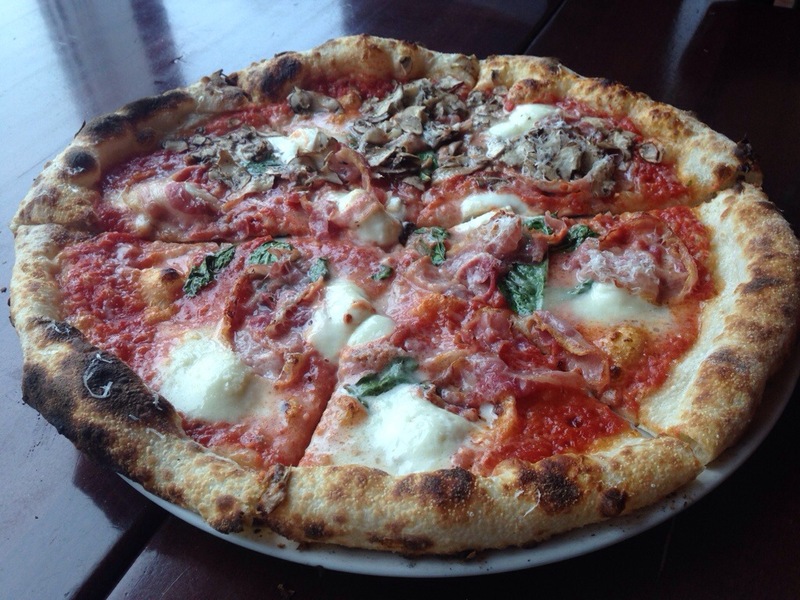 The menu is starters (antipasta), a few pastas and entrees, but the focus is on the pizza. This is a man who is passionate about pizza and it shows. There aren’t many frills in the restaurant proper, but every detail of the kitchen is attended to. The sourdough dough is hand spun and kept very thin before being topped and thrown into an 800 degree modular Swedish-made Pizza Master oven for less than three minutes. That lets the pizza achieve the perfect char, while remaining light and airy on the inside. 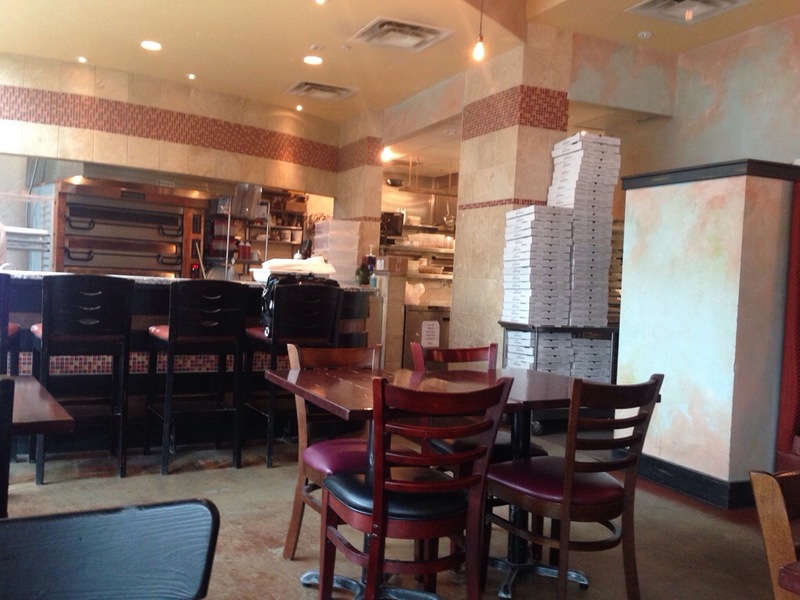 That’s Jeff Varasano’s goal, and there’s no secret to how he believes you make the best pizza. In fact, he publishes his recipe on line – including the brands of equipment he uses. 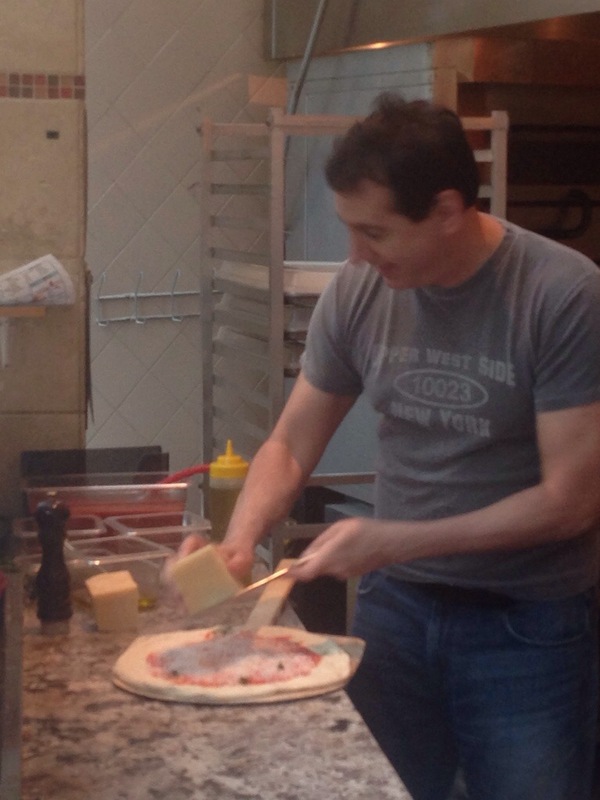 More than 20,000 words document his journey to make the New York style pizza he grew up on. The craziest part to me is that he came to Atlanta as a software developer and took his passion for pizza and has made a in-demand restaurant from it. Our server, Alexis, made a perfect recommendation, just put pancetta on everything. In your water, if you want. I liked her nearly immediately. 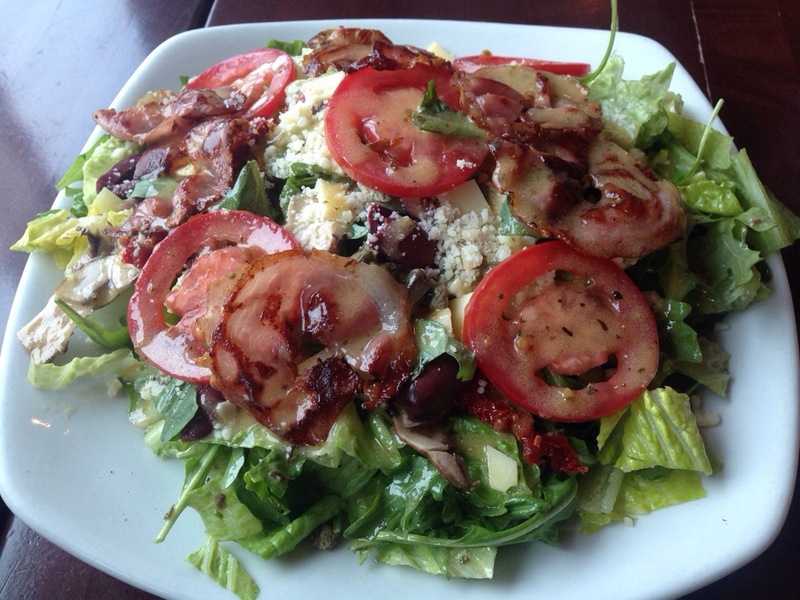 We chose to start with the house salad: mixed greens, herbs, sun-dried tomatoes, olives, capers and aged cheeses, topped with pancetta. I’m not much of a salad guy, but when I picked the mushrooms and olives out (they were gladly taken by my mate), this was fine salad. The pancetta was lightly pan fried, the tomatoes actually tasted like tomatoes (I can’t wait for summer), the cheeses were good complements and the dressing wasn’t too heavy. The only complaint could be that this salad isn’t available in a half-size, like the Ceasar and spinach salad. This pizza is easy to describe, if you read the recipe. It met all of the goals. Thin, with a charred crust? Check. Light and airy inside? Check. Sweet, salty and full flavored? Check. Not greasy? Check. Ingredients well-balance? Check. This was a really good pizza. The sauce was a little thinner than at some other high end pizzerias, but it still wasn’t runny. And the crust didn’t get soggy, even by the last slice. When we were discussing the meal afterward, Jo said that it reminded her of a pizza she shared on Lake Como with her mom on a trip they took to Switzerland nearly a decade ago. It reminded her of that immensely. It’s a nice memory, brought to life by a good pizza. As we were about halfway through our meal, a man came in through the kitchen, took off his jacket, pulled up a chair and sat down with a party of four that had been seated ten or fifteen minutes earlier. I heard the conversation (the restaurant was empty at this point except for the four of them, us and a woman at the bar near the entrance) and gathered that he was Jeff Varasano. Alexis came back by the table to see if we needed anything else, and when I asked, she confirmed that he was “the man” behind the place. He visited with them for a minute, then headed into the kitchen. Jo had mentioned the blog to Alexis and she had passed the information on to him. When we walked up, he said that he thought we had just been seated (as opposed to nearly finishing) and was going to stop by and chat when he put the pizza in the oven. We walked up to the chef’s table that fronts the kitchen and had a brief chat with him while he made a pizza. It turns out that the table of four were high school friends of his who were in town and he was cooking for them. He was courteous, gracious and engaging. And he is serious about pizza.